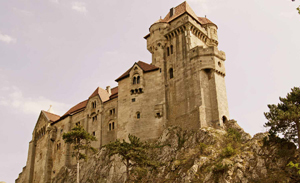 You can reach Castle Liechtenstein within 5 minutes walking from the Hotel Restaurant Hotwagner. 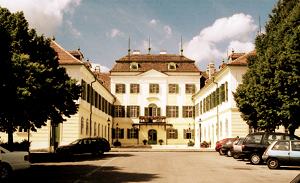 Castle Liechtenstein is in Maria Enzersdorf in Lower Austria on the edge of the Vienna forest in the nature park Föhrenberge. It is located on a cliff of about 300 m above sea level. It was first mentioned in documents in 1136. The ruling family of Liechtenstein, after whom the principality Liechtenstein is named, had their ancestral seat here. The castle was built by Hugo von Liechtenstein around 1135 as a defense tower and chapel and was part of the defense wall along the thermal lines against the enemies that mostly came from the East back then. A romantic chapel still stands. The patron saint is Saint Pankratius, the same as in the castle Mödling. Between the 13th and 15th century the castle was continuously extended. The material came from the roman quarry by Sankt Margarethen in Burgenland and the stone was very light in color, which most likely gave the castle its name. The castle was damaged by the Turks in 1480 and completely destroyed in the First Turkish Siege of Vienna. During the war with the Turks it was the shelter for people from Maria Enzersdorf and Hinterbrühl. During the Second Turkish Siege in 1683 castle Liechtenstein was destroyed again and was not rebuild till 1807 by Johann I. von Liechtenstein. To preserve history the castle was rebuilt historically accurate during the 19th century by Johann II. von Liechtenstein. The castle is the ancestral seat of the rulers of Liechtenstein. The rulers of Liechtenstein were the sole owners till about 1300. After that the ownership changed frequently. Known owners were the Barons of Khevenhüller, who own the Castle Hochosterwitz in Kärnten to this day. It was also owned by the Habsburgers or the Hungarian King Matthias Corvinus. In 1807 it once again became family property through Johann I. von Liechtenstein and remains as such till today. At that time the surrounding forest had been heavily cut down and he had it replanted with the for the region typical black pines. Additionally, the typical ruins on the Kalenderberg (“Amphitheater”, “black tower” and „Pfefferbüchsel) were built during the Romantic Time. The castle was severely damaged several times during the Russian occupation and was renovated several time and is now overseen by a private scientific club. The castle grounds of today were renovated by the house Liechtenstein during the 19th century and are still owned by them. You can see home furnishings such as furniture, weapons, reliefs, beam ceilings and the castle chapel. Furthermore, the castle offers one of the best views over Vienna. The castle can only be visited with a tour. Tours are every hour on the hour in German and English, regardless of the amount of people and take about 50 minutes. 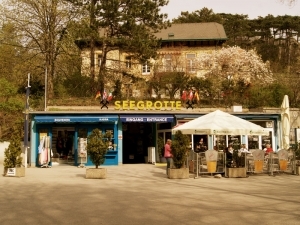 The Showmine Seegrotte is located about a 15 minute walk/ 5 minute drive from the Hotel Restaurant Hotwagner. It is located in the adjacent town of Hinterbrühl. In 1848 a miller started to remove land plaster after he came across the plaster at a depth of 5 m while digging a new well. The land plaster was then milled at a mill in Mödlingen. Because of a detonation in 1912 there was an ingress of water of more than 20,000 cubic meters, which made it impossible to use it further. For many years the mine lay quiet and a large lake formed. Friedrich Fischer (1876-1955), a liqueur manufacturer from Vienna, bought the mine in 1918. Originally he wanted to open a pleasure establishment. Later he tried his hand at a mushroom farm, which didn’t work due to the low temperatures. In 1920 he had the 200m long mine transportation tunnel, which was still made out of wood from the mining times, reinforced with bricks. At the beginning of the 1930s electricity was brought into the mine. The show mine was opened June 8th.1932 with an old military ponton and en electric boat. In 1943 the Deutsche Reich began to put important storage and businesses under ground. They originally tried to store cooking fats, which didn’t work due to the high humidity. Thus large amounts of technical grease were stored in barrels in the mine. Objects of cultural value were also stored to prevent damage by the war. During that time the showmine was still open as well. Not till May 1st.1944 did they confiscate the mine and they installed an airplane factory from the Heinkelwerke under the cover name Languste there because it was relatively secure from bombings. That was proven by the first hit by a bomb on May 24th.1944 which didn’t do any damage inside the mine. The water on the ground of the mine was completely pumped out, leveled and covered with concrete. The hull of the Heinkel He 162 (also called Salamander) was build there as a prototype, transported out in parts and reassembled on the grounds of the Vienna airport of today in Schwechat. In December 1944 about 600 concentration camp inmates worked there under the supervision of 170 skilled workers. The concentration camp inmates were housed in the outpost of the KZ Mauthausen and had to work here under inhuman conditions. A memorial was build here in their memory in 1988. In some spots marble and bronze statues from the Franzensburg in Laxenburg were walled in there to protect them from the war. Duration of the complete tour including a boat ride: 45 minutes. The wait time for a tour is about ca. 20 minutes. The Sea grotto is open year-round. Zoological garden – Free admission! Kids (under 19): Free admission! 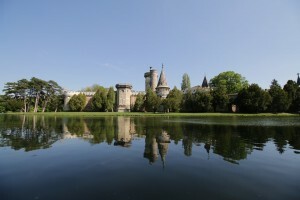 The castles of Laxenburg as well as the wonderful Schlosspark are only 17 minutes from the Hotel-Restaurant Hotwagner away. In the beautiful Schlosspark you will find the old castle Alte Schloss and the Blaue Hof (the new castle), as well as the Franzensburg. Along a romantic park landscape you will also find a lot of points of interest in the many park areas. Maria Enzersdorf is well worth a trip and is very close to Vienna. It offers the nature reserve Liechtenstein – Föhrenberge, the castle Liechtenstein, the Föhrenbergen, the Hunyadi castle and the pilgrimage church Maria Enzersdorf. 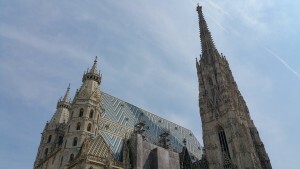 Maria Enzersdorf consists of the old city Altort, which is located at the edge of the Vienna forest and the south part of the city Südstadt, in the eastern part of the Vienna basin. Attention pilgrims: Our hotel is staring point for a lot of pilgrims who follow the “Via Sacra” to Mariazell. Even centuries ago pilgrims looked back to Vienna one last time on top of the hill Urlauberkreuzes (directly above the Hotel Restaurant Hotwagners) before going on their journey to Mariazell. You can reach Baden by Vienna over the romantic wine street in only 20 min. It offers visitors healing sulfur thermal springs, i.e. 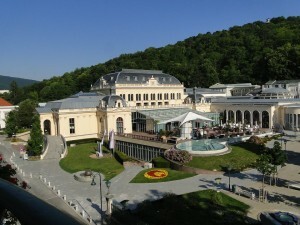 at the Römertherme, countless hiking and nature trails as well as one of the prettiest european Casinos. Directly at our front door is the nature reserve Liechtenstein. You can hike along the marked trails on the Kalenderberg and discover the countless points of interest such as the Castle and the Palace Liechtenstein, the “Amphitheater” or the „Schwarzer Turm“ (black tower). On the backside of the Kalenderberg visitors can enjoy the amazing view of the neighboring towns of Hinterbrühl and Mödling. In the park there are three look-outs that were built before 1900 and that are still open to the public today: the Wilhelmswarte on the highes point of the Anninger, the Kaiser-Jubiläumswarte (1898) on the Eschenkogel (close to the Anninger) as well as the Josefswarte that opened on the 29th of June in 1881 on the Hinteren Föhrenberg. 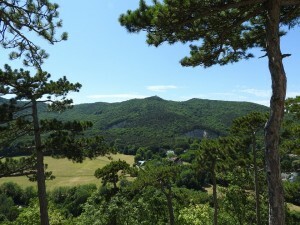 The nature reserve is about 6.500 ha big and stretches from Perchtoldsdorf in the north to Gumpoldskirchen. The name comes from the many Austrian black pine (Schwarz-Föhren, in Vienna also called Parapluiebäume) that grow on the limestone ground. The palace Liechtenstein was build very close to the castle on the hill in 1820 under Johann I. as a summer residence. The leading architects were Joseph Kornhäusel and Joseph Engel. The palace became a protected monument in 1932. The palace was damaged during the occupation by the Soviets after the Second World War and the following appropriation as a camp for Hungarian refugees in 1956 which lead the rulers of the Liechtenstein house to sell it. The east wing and the adjoining building were removed in 1961. The side wings were rebuilt true to the original between 1977 and 1989. Today the reconstructed palace is a senior living facility and during the summer there are theater productions in the basement. You can only view the palace from the outside. During walks through the Föhrenberge on the Kalenderberg you can find, in the middle of the forest, several ruins. They were build under Johann I. and they are influenced by the Romantic period at the beginning of the 18. century. The three-story tower Schwarzer Turm was build on the foundation of an old look-out and is still being used today. The Amphitheater was build in 1810/11 to look like a roman ruin with 16 arches with massive pillars, combined with dorian columns. The Johannes or Pilgrim chapel Pfefferbüchsel used to have a top shaped like a spice tin and was more often called Pfefferbüchsel because of that. It was destroyed in 1848 and not rebuilt. Just ask for a trail map in the hotel and you will surely walk past at some point. The Vienna merchant Joseph Patuzzi had this late baroque palace built in the middle of the 18th century. The name comes from the married couple Alexandrine and Koloman Count Hunyadi, who lived at the palace from 1876 till 1901. The three winged palace has remarkable stucco and beautiful paintings and is surrounded by a wonderful park with many old trees. The palace is popular for events, weddings and balls. In addition, the cultural days of Maria Enzersdorf and the Advent and Easter markets take place here. The smaller palace Auf der Weide was build for Johann Paul Grädl von Ehrenthal in 1730 and is at the edge of the Bergschenhoekpark. Only the representation wing of the palace is still standing but it’s furnished with splendid elements from the late Baroque and the beginnings of the Rokoko. The church was build in the 15 century and is the oldest Franciscan convent in lower Austria. It is located in the old part of Maria Enzersdorf. The inside of the church is dominated by the baroque high altar with the picture of the patron saint of the church Maria Magdalena.The high altar is flanked by four marble pillars and four live-sized statues of Franz von Assisi, Antonius von Padua, Cardinal Bonaventura and Bishop Ludwig von Toulouse and is crowned by a depiction of the Holy Trinity. On the left there are 2 chapels. The small Josef chapel was build in 1653 and was originally furnished with a Maria altar which was replaced by a Josef altar in 1752. Tip: A nativity scene made out of wonderfully carved and painted wooden figurines, that wear real clothes and are almost live-sized, is placed in front of the altar during the Christmas season. The 2. chapel is used for praying. You can get to the Lourde grotto through the cloister with its many marble plates, which express gratitude for answered prayers. The grotto was built in the late 19th century and is completely encased in quarry stones. There is a staircase on the side to the priest chambers and the walls are almost completely covered with pictures that originated from believers asking for or thanking for help. The most valuable pictures and gifts are kept behind a wrought-iron grate. The pilgrim church Maria Enzersdorf is only a 5 min. drive away from the Hotel Restaurant Hotwagner (buses available). Parking is located in the big Pilgerhof. You can also take a break in the green space there. You can get to the capital best by taking the A21 and you will be in the center in 35 minutes. You can also take the subway line U6 Siebenhirten or the train Schnellbahn Mödling and can get to the city without a car! The gorgeous Ringstraße and the countless sight-seeing places (Stephansdom, Schloss Belvedere, Tiergarten Schönbrunn, Wiener Rathaus, Spanische Hofreitschule, etc.) will make your visit unforgettable. To have fun visit the Prater, where you have to ride the Ferris wheel. Those who want to go shopping should go to the wonderful Kärntner Straße. We would be happy to give you a map of Vienna! You can take a trip to the sweet world of chocolate in the chocolate museum Confiserie Heindl in VIenna. The museum is located about 15 minutes from the Hotel Hotwagner and offers you a view into the high art of making confectionery of the house Heindl. You can see the making of confectionery classics like the Sissi-Taler, chocolate maroons or Nussbeugel and you can also take a tour to learn more about the chocolate. The highlight for those with a sweet tooth: 3 chocolate fountains with dark, 100% Java whole milk or white chocolate. One of the largest shopping centers in Europe with a space of about 192.500 m²: Access via Maria Enzersdorf- Südstadt is only a 12 min drive away (buses available). It has more than 330 stores and you can go shopping to your hearts desire. For those who want to rest afterwards there is a cinema attached.